Note: This article was first published on 27th March 2019 and the products are now available in retail. After returning to the local notebook scene last year with the S11 and S13, Vaio is back again with three new notebooks. 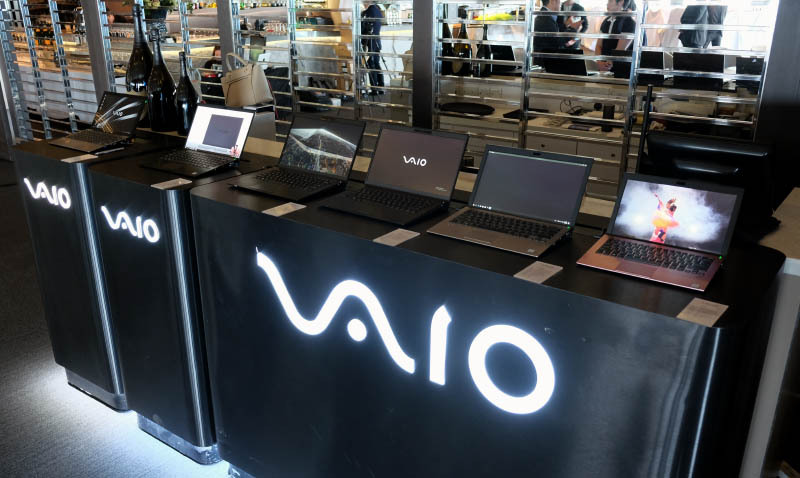 Aside from introducing the new notebooks, Vaio also spoke about their 快 philosophy. In a world where notebook manufacturers are focused on features and specifications, it’s refreshing to see that some brands are taking a more holistic approach to their notebooks. According to Vaio, 快 (kanji for Kai) can be loosely translated to mean “Emotionally Cool, Emotionally Comfortable.” It’s a binding philosophy behind their notebooks and it also explains some of the design choices behind their notebooks. 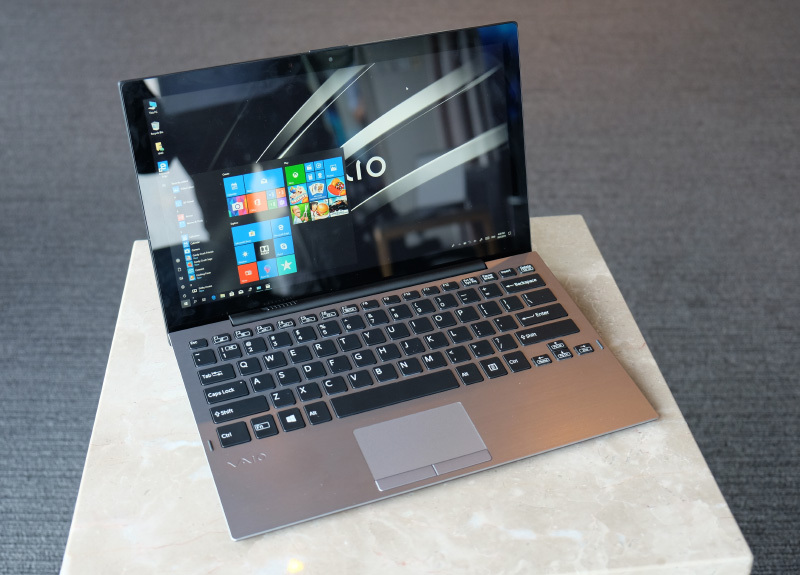 In the pursuit of 快, Vaio has decided that their notebooks must be a couple of things: it has to be sleek and light, it must be well-built and reliable, and it must offer features that users need. The whole idea is so that users feel at ease and confident about their notebooks. It’s a uniquely Japanese perspective towards product design and one that has an profound impact on the Vaio notebooks that you see here. 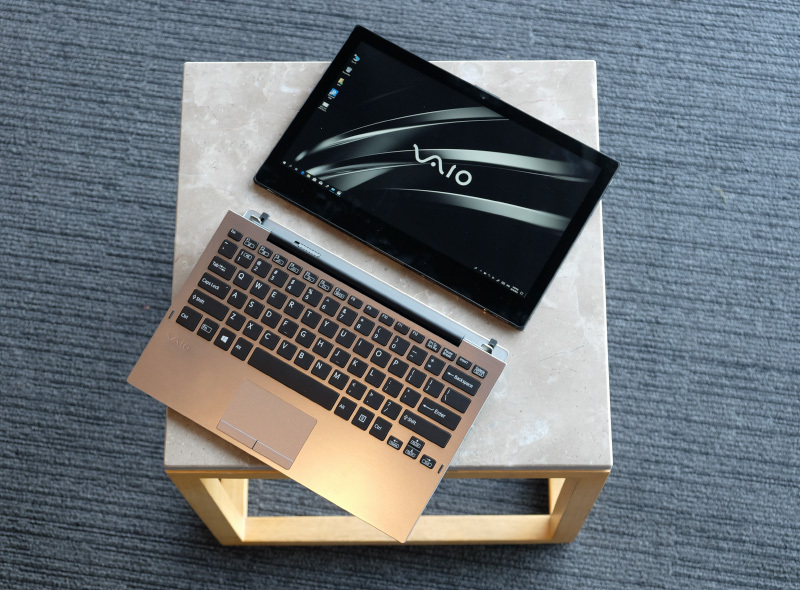 The SE14 is the first notebook that was designed just for this region - with Vaio Japan’s blessing and sign-off, of course. It’s a 14-inch ultraportable packing a decent display, the latest Intel Whiskey Lake processors, a good selection of ports, and an attractive price. The SE14 comes in dark grey and red copper. Don’t be fooled by the name, they look more conservative and subdued in the flesh. They are not flashy at all. Tipping the scales at 1.35kg, it is comparable in terms of weight to most ultraportable notebooks of its class. However, it is quite thick at 19.55mm. The upside to this is that it has a good selection of ports which I will talk about later. The 14-inch display employs IPS technology and has Full-HD resolution. Inside, you’ll find the latest Whiskey Lake processors. As the table below shows, there are two configurations to choose from, one with a Core i5 and another with a Core i7. Don’t be fooled into thinking that the Core i5 is insufficient. It’s a brisk machine and will probably suffice for most users out there. Consider the pricier Core i7 configuration only if you are a serious multi-tasker and have more demanding memory or storage requirements. 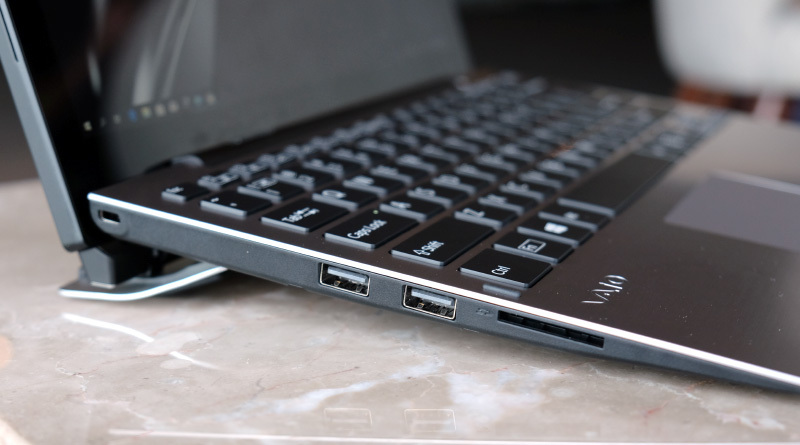 Unlike most ultraportable notebooks today which only come with USB-C ports, the SE14 has two USB-C ports supporting USB 3.1 Gen 1, and two USB-A ports also supporting USB 3.1 Gen 1. On top of that, you also get a full-size HDMI 1.4 port, a headphone/microphone audio combo jack, and a microSD card reader. This assortment of ports relates to the 快 concept by minimizing the need for dongles, which can, and often does, go missing at inopportune moments. Nevertheless, I do have a gripe that is the lack of Thunderbolt 3 support that I hoped would be present in the more expensive model. For most readers, the most attractive aspect of the Vaio SE14 has got to be the price. For S$1,499, it’s one of, if not the most affordable notebook in its class. And with its decent specifications and high level of build quality, the SE14 is an attractive proposition. 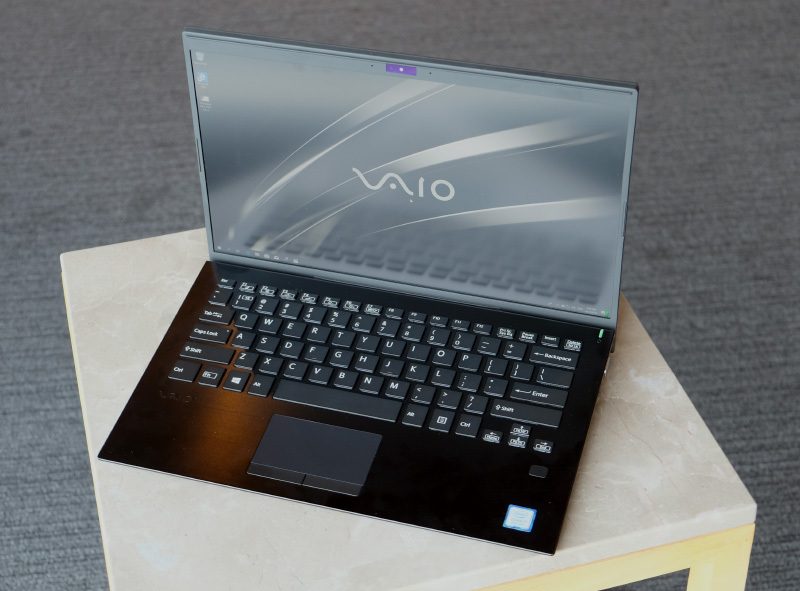 The Vaio SE14 will be available from the 15th April and for readers who like to do some light gaming, it’s worth noting that a version with discrete graphics is in the works and that will be arriving a further month later. The phrase “Made in Japan” still carries a certain gravitas in some circles and for some people. If you are a Japanophile, it used to be that you could get notebooks made in Japan from Toshiba, NEC, Fujitsu, and Vaio (when it was still part of Sony). Now, they are all gone from retail (they still exist for corporate purchase needs) and only Vaio remains accessible to consumers. To be clear, not all Vaio notebooks are made in Japan. The SE 14 shown earlier isn’t but the SX14 and the A12 below are. Honestly, just by touch alone, I couldn’t tell that the SX14 and A12 were “Made in Japan” notebooks and the SE14 wasn’t. That actually says a lot about the quality of the SE14. But this “Made in Japan” label is one of the SX14’s highlights, especially if you love all things Japanese. 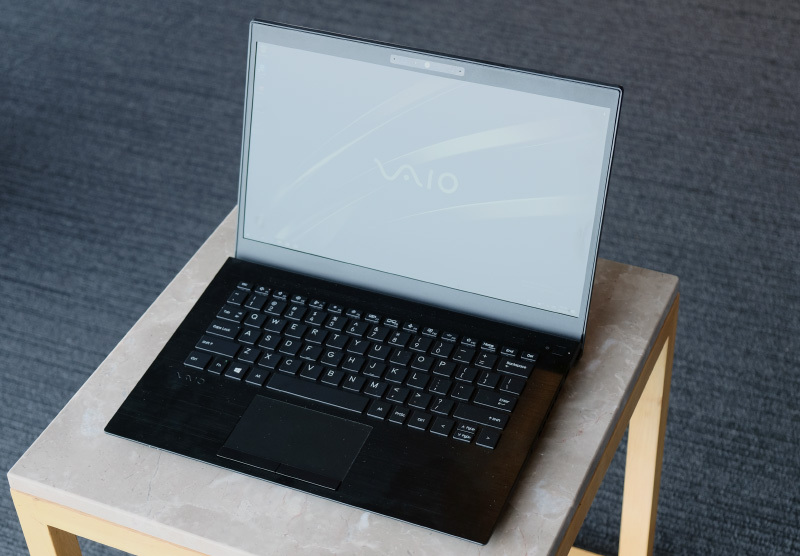 The Vaio SX14 is also a 14-inch notebook but it has a lighter and slightly thinner body. The chassis is a blend of carbon fiber and magnesium alloy (similar to the ultra-light LG gram) and only weighs 1.05kg. 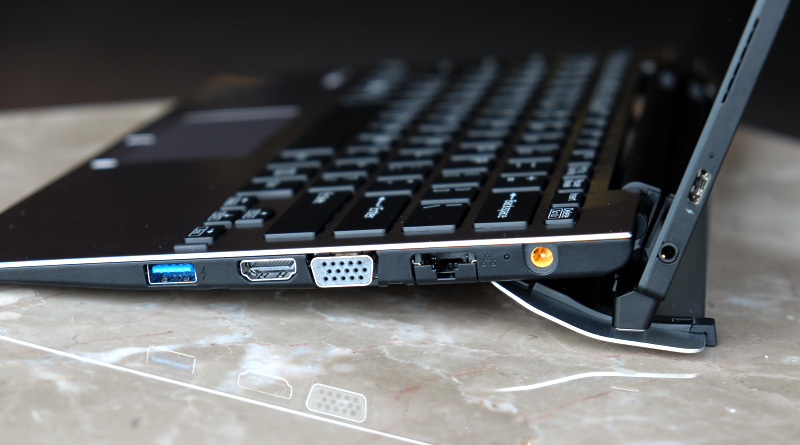 It measures about 17.8mm thick, but like the SE14, the SX14 also comes with a good assortment of ports. The SX14 will be available in black, silver, and brown. The SX14’s 14-inch display can be in either Full-HD or 4K resolution. And inside, it is powered by the latest 8th generation Intel Whiskey Lake processors. 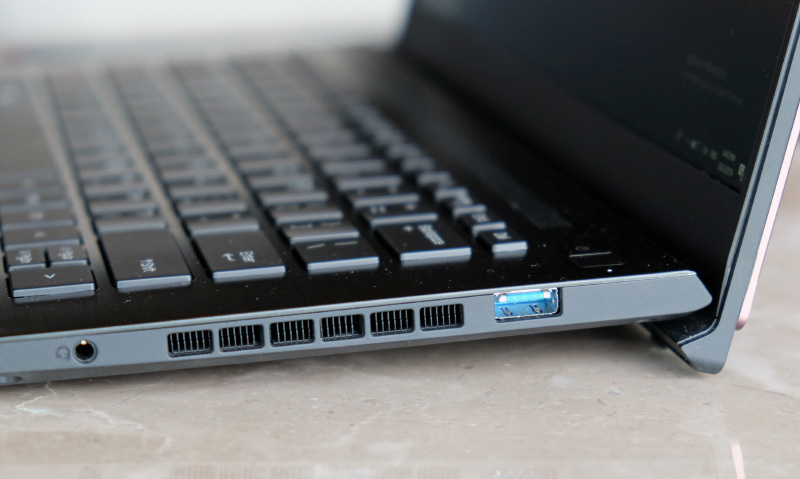 Like the SE14, the SX14 has a rich selection of ports which negates the use of dongles. 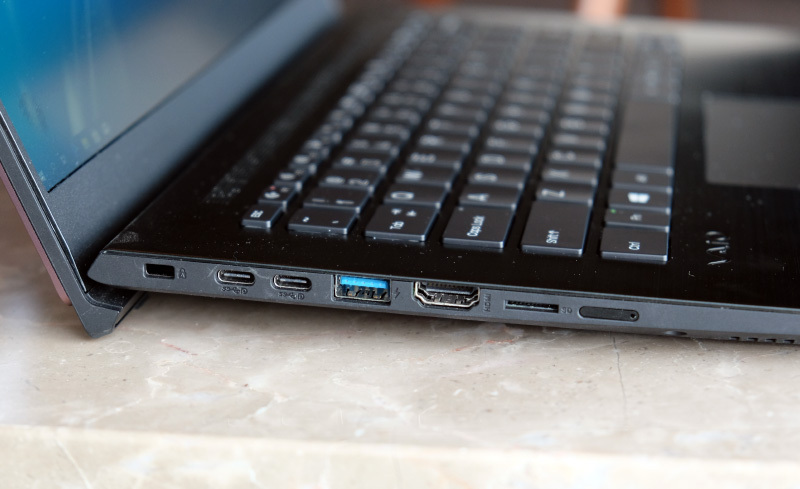 There’s a single USB-C port that supports USB 3.1 Gen 1, three full-size USB-A ports, a Gigabit Ethernet LAN port, an HDMI port, and curiously, even a VGA port. There’s also a full-size SD card reader. The only glaring omission is support for Thunderbolt 3. Even so, and as I said earlier, it’s unlikely you will ever need to hunt for a dongle with the SX14, which reinforces the Vaio philosophy of 快. There will be three configurations of the SX14 at launch and you can see them in the table below. Prices of the SX14 start at S$2,299 and they are expected to be available around June. The Vaio A12 is a detachable notebook a la Surface Pro but with a proper hard keyboard that you can dock the display into. Unlike the SE14 and SX14, the A12 will only come in black. It has a 12-inch Full-HD IPS display that can be detached from its keyboard base to function as a tablet. In tablet mode, the A12 weighs about 610g and measures about 7.4mm thick. That makes it significantly thinner and lighter than the Surface Pro 6, which is 792g and 8.5mm thick. That said, it does come with a less powerful processor but more on that later. With the keyboard attached, the A12 weighs 1.2kg and measures about 20mm thick. Much of the thickness actually comes from the fact that the keyboard is quite steeply angled. The rear is raised by a special cradle that was designed to give a more comfortable typing angle. Unfortunately, this also has the unwanted side effect of making the unit quite thick. The keyboard is also where most of the A12’s I/O ports are located. Like the SE14 and SX14, the A12 has a wealth of ports that far eclipses the Surface Pro 6. 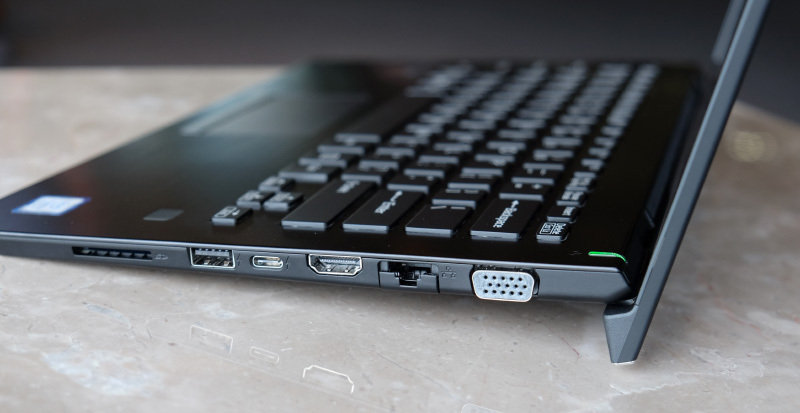 On top of the USB-C port that is on the tablet, the keyboard is home to a full-size USB-A port supporting USB 3.0, two USB-A USB 2.0 ports, a Gigabit Ethernet port, a full-size HDMI port, and a full-size SD card reader. 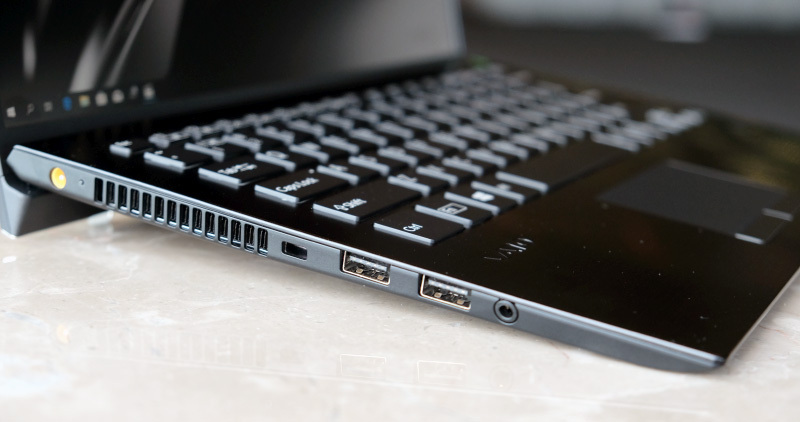 The number of connectivity options that these Vaio notebooks have is quite amazing and completely antithetical to most ultraportables these days which typically only have USB-C ports. To achieve the A12’s slimness and lightweight, it is powered by a low-power Y-series Intel Amber Lake processor. For what it’s worth, Apple uses the same class of processor in its new MacBook Air. These highly efficient processors only have a TDP of 5W allowing them to do without active cooling and fit into super-thin devices. There are Core i5 and Core i7 variants available and I had a go with the entry-level Core i5 unit with 8GB of memory and a 256GB SSD and I found it to be surprisingly brisk. Like the SX14, the A12 will be available in June with prices starting at S$2,749. Plans to bring in the LTE version of the A12 is in the works.